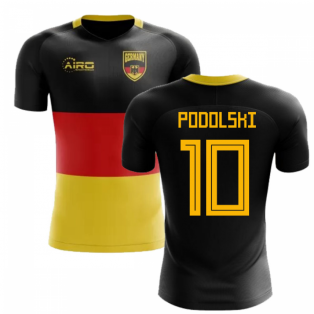 Show your support for the German national team at the World Cup Finals with the latest home & away jerseys from Adidas. We have the new Germany football shirts available in adult, kids, womens & infant sizes and you can personalise your kit with the name and number of your favourite player - past or present - including Mesut Ozil, Julian Draxler, Mario Gotze, Franz Beckenbauer or even your own name and number. 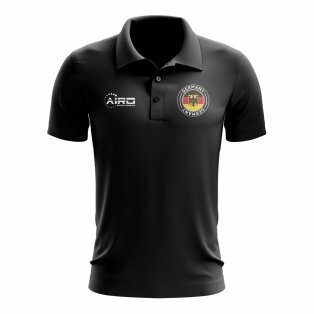 Add official training & leisure wear to your collection, including tracksuits, polo shirts, training tops, socks, shorts, jackets, hoodies & lots more. We have all the latest colours and styles and everything we sell is 100% authentic. 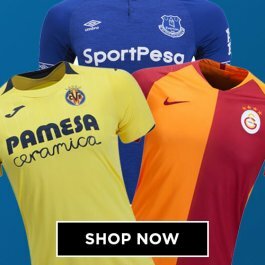 Buy with confidence from UKSoccershop - a leading football shirt retailer since 2004. 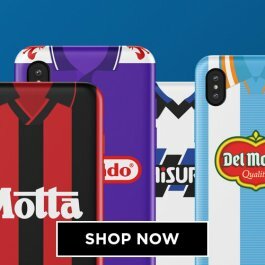 We offer fast worldwide delivery to every country in the world and accept a number of secure payment options including Visa, Mastercard, American Express and Paypal. The Germany national team are one of the most powerful and consistent sides in international football, with an excellent record in both the World Cup and European Championship Finals. Many of the games greatest ever players have worn the German football shirt over the years including Franz Beckenbauer, Jurgen Klinsmann, Michael Ballack and Bastian Schweinsteiger. 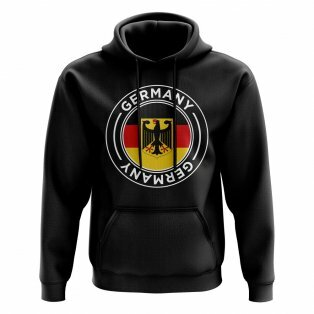 We have the full range of authentic Germany merchandise and Germany football clothing in our dedicated German store, with great deals on official, licensed products from kit manufacturer Adidas. The Germany home shirt is our best selling international soccer jersey and is available in a full range of adult, junior, womens and infant sizes, complete with socks and shorts. The Germany away shirt is currently green in colour which is a deviation from the more traditional black jersey. 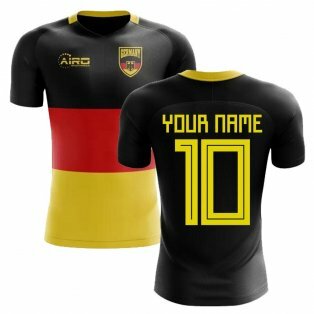 Our full range of Germany football kits can be customised with the name and number of your favourite star. All our international shirt printing includes the small front number and you can even add your own personal name and number in the German shirt printing style. Adidas produce a fantastic range of Germany training wear. 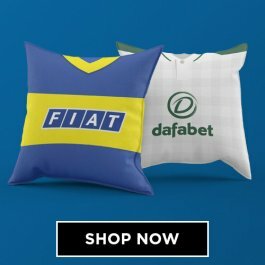 This includes jackets, training jerseys, polo shirts, hoodies, fleeces, sweat tops, woven shorts, windbreakers, tracksuits and much more. 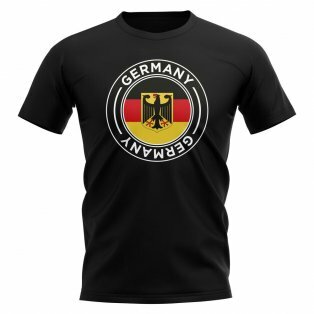 We also provide a cool range of Germany t-shirts which are very reasonably priced and are a great gift item. 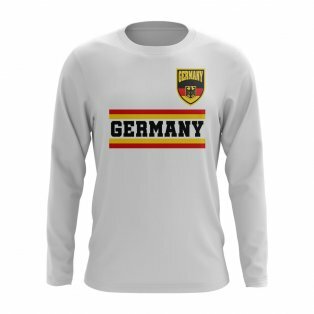 For the more nostalgic football fan, check out our range of classic Germany retro shirts from Toffs and Copa which includes remakes of some of the most classic German football kits from recent years. In particular, our vintage kit from the era of the legendary Frank Beckenbauer proves to be especially popular. Finally, be sure not to miss out range of cheap Germany shirts with great clearance deals on replica kit, training wear and accessories. As one of the most dominant international football shirts and one of the largest European nations, it is no surprise that Germany is consistently in our top 3 sales ranking for shirt sales each season. 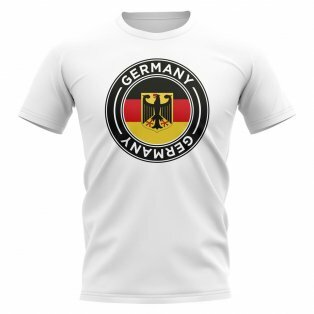 The Germans play in a white home shirt and are one of the most successful national teams having won four World Cups and three European Championships. The Germans have produced many of football’s greatest ever players with Jurgen Klinsmann, Franz Beckenbauer, Lothar Matthaus, Mesut Ozil, Rudi Voller, Michael Ballack and Miroslav Klose just some of the stars who have served with distinction for the national team. The national team’s nickname is ‘Die Mannschaft’ which translates as ‘The Team’. It is an apt description of the Germans who have always demonstrated an incredible teamwork and togetherness which has been the foundation of their consistent success at major tournaments. They play their fixtures at Bayern Munich’s Allianz Arena, which was built for the 2006 World Cup which they hosted. Despite impressive showings at the tournament, they were beaten in the semi-finals by a Fabio Cannavaro inspired Italy, who went on to win the tournament. The national team’s home kit is made up of a white shirt, black shorts and white socks – a colour schemed inspired by the 19th century flag of the north German state of Prussia. Since 1988, the kits have featured detailing based on the red, yellow and black colour scheme of the modern German flag. 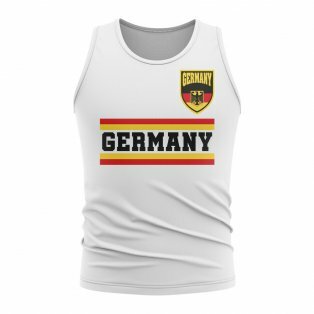 One of the more memorable German home shirts was the classic kit worn in the 1990 World Cup, which featured a jagged line in the colours of the flag across the chest. The kit was immortalised in German football history after a penalty by full-back Andreas Brehme was enough to see off Diego Maradona’s Argentina and lift the Jules Rimet Trophy for the 3rd time. At the 2014 World Cup, the flag colours again featured prominently on the shirt as a chevron on the front of the jersey. Once again, Germany were victorious, again beating Argentina in the final after a goal from Mario Gotze. Kit manufacturers may want to note this trend and ensure the flag plays a significant part of the design for future tournaments! 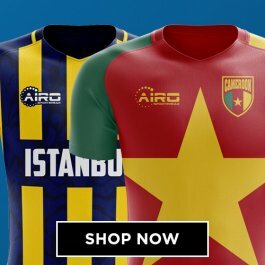 The away kit has had many colour changed throughout the years. In the early days, a bright green jersey with white shorts was common place. 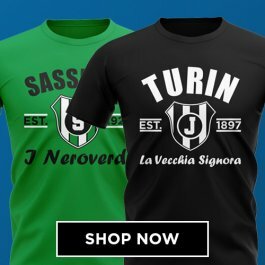 It is widely thought that this was in tribute to Ireland, who were the first country to agree to face Germany after the end of World War II, however it was actually Switzerland who were the first team to do so. Black and red have been the other most commonly used colours, with the 2014 World Cup kit incorporating both colours into a beautiful horizontally striped design. With Adidas the dominant sports brand in Germany, it is no surprise that they have had a long standing partnership with the national team. Starting in 1954, Germany have always worn Adidas branded kit except for a period in the 1970’s when the kits were made by Erima, a subsidiary of the Adidas brand. 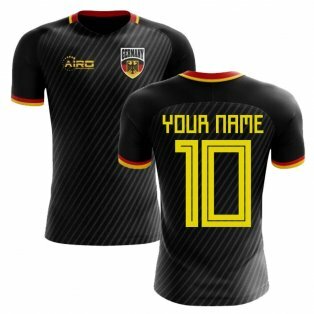 Outside the English national team, German shirt printing is our most commonly sold international football kit. With such a pool of stars, both past and present to choose from and even your own custom printing, our choice of Germany shirt printing is a major factor in German jerseys being one of our bestselling football kits. 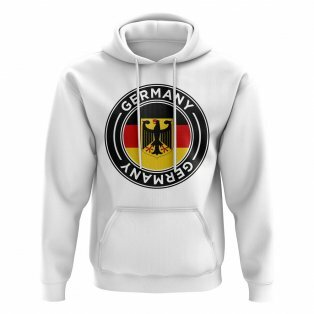 As one of the best supported national teams in the world, it is unsurprising that there is a huge selection of official Germany merchandise and clothing available through our football store. 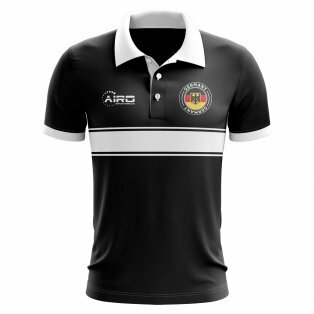 Tracksuits, polo shirts, training jerseys, t-shirts, hoodies, sweat tops, training pants, training shorts, leisure tees, windbreaker jackets and replica tees are just some of the items available to buy online in adult and kids sizes.